2-room apartment 50 m2 on 1st floor. Cosy furnishings: 1 double bedroom with 1 double bed. Exit to the balcony, south facing position. 1 room with 1 x 2 bunk beds. Exit to the balcony, south facing position. Kitchen-/living room (4 hot plates, oven, electric coffee machine, fondue Set (cheese)) with satellite TV (flat screen). Bath/WC. Oil heating. Large balcony. Terrace furniture, deck chairs (2). Marvellous panoramic view of the mountains, the countryside and Matterhorn. Facilities: Internet (WiFi, free). Reserved parking space n 3 at 20 m. Please note: non-smokers only. Cosy apartment block Olympia, 4 storeys, built in 1971. On the outskirts, 800 m from the centre, in a quiet, sunny position, located by a road. For shared use: property, lawn 150 m2. Children's playground. In the house: storage room for skis, washing machine. 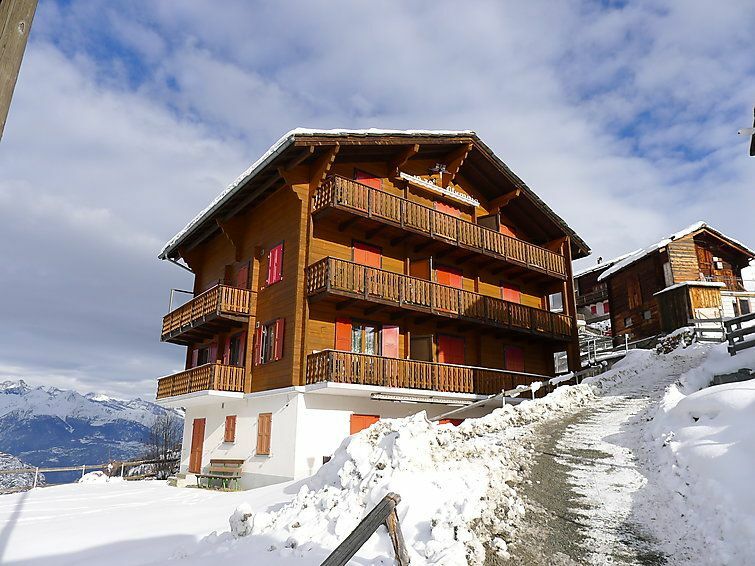 Shop, grocery 800 m, supermarket 1 km, restaurant 300 m, bus stop 800 m. Tennis 950 m, cable car 800 m, ski school 950 m. Please note: In case of good snow conditions, the house is accessible on skis. Additional services for Haus Olympia guests: tennis, badminton, fitness, indoor playground for children, climbing garden, rope park, Robis forest playground, mini golf, ice skating. Sauber, ruhig und mit toller Aussicht. Saubere und gut eingerichtete Wohnung mit Walliser Charme.